The temperate winter climate of Miami, Florida is serving as a pleasing backdrop for the numerous attendees of the North American Bitcoin Conference. The symposium, being held at the Miami Beach Convention Center this weekend, brought a huge crowd. Many of the talks were held with all seats full. In the afternoon, the second hall, used in the morning for merchant vendor workshops, was used as an additional seating area with the speakers being broadcasted on a large video screen. Here are some highlights from Day One of the conference. They say that crime doesn’t pay. It probably doesn’t in the long-term. But criminals still use monetary instruments in order to break laws. And despite the media exposure bitcoin has received regarding scams, thefts and the sale of illicit goods, most crooks still use cash. David Aylor is a South Carolina attorney who is involved with what is likely the first case where the federal government has seized bitcoin. His presentation ‘Bitcoin, Dirtier than Real Money?’ made the argument that there’s plenty of good to be had with cryptocurrencies, and that it is going to attract bad actors just like any other technology would. 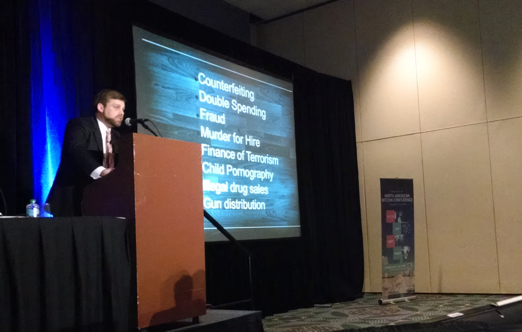 Craigslist was an example that Aylor used as a tool that can be used for good as well as bad. Bitcoin can be used the same way and the media’s portrayal of BTC is one of the reasons that some people “think bitcoin is evil”, he said. Silk Road attorney David Aylor outlining daily illicit activities conducted with cash “that don’t make the New York Times”. Aylor advocated for candor and transparency within the bitcoin economy in order to propel it forward. A lack of honesty is a problem that could thwart bitcoin’s success. “We don’t want to become a rouge industry based on secrecy,” he said. Eric Benz, VP of Business Development for ZipZap, made the case that there is a business use for bitcoin, and that it is inevitable that the negative news as it relates to bitcoin will result in compliance policies coming from governments. “We need smart regulation that does not stifle innovation,” he said. ZipZap should know. The company allows people to complete online transactions with cash in thousands of physical locations around the globe. Bitcoin conferences are usually an exciting time for enthusiasts to get together and talk about potential. Day One’s venture capital panel did just that. Roger Ver the CEO of MemoryDealers.com and an angel investor, Marc van der Chijs a partner at CrossPacific Capital, Matthew Roszak the co-founder of SilkRoad Equity and Rik Willard who is founder of MintCombine all offered opinions about VC interests. Investor Rik Willard made it clear that virtual currencies will bring “a lot of things you can’t even think of yet”. Roger Ver echoed that sentiment, saying that bitcoin’s opportunities scale globally. “Bitcoin doesn’t care where you come from,” he said. Economist Jeffery Tucker, the founder of Liberty.me, took to task traditional economists who do not have favorable views of bitcoin, specifically a certain author of New York Times op-eds. “Does it really matter what Paul Krugman thinks?” he asked the audience. 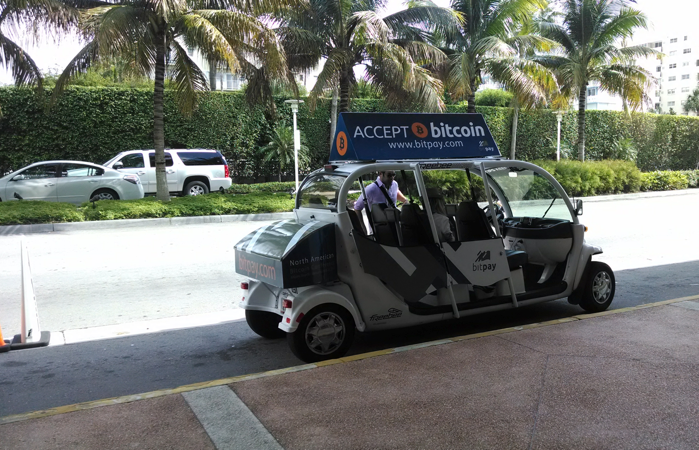 Bitcoin was accepted for rides from the parking area to the convention center. Tony Gallippi, the CEO of BitPay, pointed specifically to Miami as a place where a prosperous hub for bitcoin-related activity could happen. “Miami is an amazing city for international business,” he said during his presentation. Gallippi pointed out that TigerDirect, an online retailer that recently started accepting bitcoins, is based in Miami. How burgeoning businesses should be operating in the face of possible regulatory sanctions dominated the startup panel that featured leaders from several different BTC-related businesses. Wendell Davis the founder of Hive Wallet, Steve Beauregard the founder and CEO of GoCoin, Dan Held the product manager of ZeroBlock, Oleh Zadoretskyy the founder and lead developer of BTC Robot and Paul Vernon the CEO of Cryptsy were the panelists. Interestingly enough, only Cryptsy was incorporated in the United States. The other companies on the panel cited different countries for incorporation because of somewhat murky US policies in regards to cryptocurrencies. 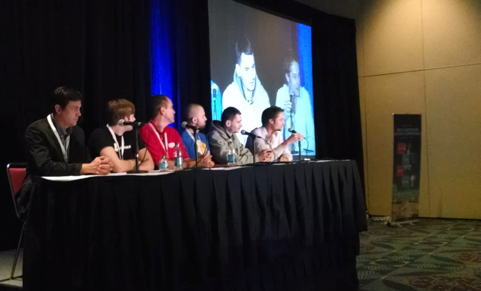 Bitcoin startup panel at BTC Miami. Paul Vernon, Cryptsy’s CEO, welcomed the idea of BitLicenses, a regulatory framework that the state of New York is considering. “I think the BitLicense is a great idea. I hope that every state does that,” he said. Day One of the conference was capped off by angel investor and bitcoin advocate Roger Ver and he did not disappoint. When asked about the future value of bitcoin, Ver was understandably bullish about price. “It’s very, very clear that it is going to be higher than it is today,” he said. Perhaps the most intriguing though that Ver conveyed was his opinion on mining. “It’s a market that has huge potential,” he said. Ver pegged bitcoin mining as a $1 billion industry given the roughly one million coins that will be rewarded over the next year. “I don’t think anyone understands how big this industry will be,” he said. Keep checking back with CoinDesk for highlights from Day Two of the North American Bitcoin Conference in Miami.